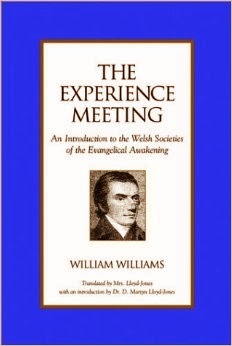 If you are a small group leader, Sunday school teacher, pastor, or meeting regularly with Christians in any on-going capacity, I highly encourage you to read William Williams little book called The Experience Meeting. This book gets at the heart of Christian growth as Christians meet in various groups. In a day when Christians want to throw off the regular meeting of believers, Williams reminds us that “the best procedure for believers in all conditions…is to maintain regular attendance at…religious fellowships until the day dawn, and the Lord Himself comes into the midst” (19). Williams believes the gathering of believers in any context to be the place the Holy Spirit does his work. As I shift my roles at Risen Life Church from being the Youth and College Pastor to being the Pastor of Discipleship this little book has been a great reminder of the way God uses the fellowship of believers to lead, guide, sanctify, encourage, teach, and rebuke His bride through the Spirit that indwells every believer. Particularly, I was highly encouraged by Williams focus on the collective work among believers by the Holy Spirit, his reminders of why Christian gatherings are so important, his focus on the grace of God in Christian meetings, and his profuse thinking on what we should ask of teachers, new members, and regular members. I ran across this little book while reading Timothy Keller’s book Center Church. Keller mentioned it as a “classic guide” on the subject of small groups, and that it is. The Experience Meeting was written in the 18th century as a dialogue between Theophilus and Eusebius and gives us a small peak into the value Christians of the time placed on meeting together. We would do well in our day and age to revive our interest in the type of Christian meeting Williams is describing. To peak your interest a little more, The Experience Meeting was translated by none other than Mrs. Lloyd-Jones. That’s right, the wife of Dr. D. Martyn Lloyd-Jones. What a partner in ministry wives can be! Throughout Williams book there is a refreshing and radical appeal to the Holy Spirit in the midst of believers to do something special as they meet. Williams aptly describes the situation of most believers when they come together as he speaks about the way the Holy Spirit infused one of his meetings. Believers had come together feeling lifeless, beat down, tempted on all sides by Satan, not even wanting to meet together, and well in need of encouragement from the Lord. It is here that God by his Spirit, when the group decided to pray, breathed life. The Spirit poured in love, faith, hope, a joyful spirit, and a glorious multitude of Graces (8-9). Williams rightly sees the Lord as the head of all Christian societies, and it is His Spirit that we want to appeal to in all our meetings (18). Whatever is done in a meeting Williams wants even the details placed in the hands of the Holy Spirit so that the group can grow closer to the Lord (21). It is the Holy Spirit that convicts, rebukes, and teaches the people of God and it is appeal to this person of the Trinity that must be cultivated in all of our Christian gatherings. 1 – They are a means of keeping up the liveliness of our Christian walk (13). 2 – They help us unravel the snares of the Satan (14). 3 – They forestall and prevent problems between brothers and sisters in Christ (14). 4 – They help to hold the members accountable to Godly living (14). 5 – They allow brothers and sisters in Christ to bear one another’s burdens (15). 6 – They give us a venue to declare the work of God on our souls and to praise His name for it (15). 7- They are profitable for strengthening ourselves against spiritual enemies and praying together as one man (16). Before we become too dogmatic about these gatherings and the ways that they should operate, Williams infuses tons of grace into his formula. This can be seen when he talks about the general instruction of the group. He says if the instruction is not going well, then it is probably better to stop and spend some time singing, praying, or in some other exercise that will promote conviction, instruction, and comfort (31). How comforting is that! For Williams everything is focused on the state of the member’s soul and their communion with the Spirit of God (55). His dependence on the grace of God allows him the freedom to follow the Spirit. We would do well to consider the same in our meetings. Even in speaking of who should be a member of a Christian society, Williams again defaults to a graceful stance. He says, however feeble the signs of grace in a person, as long as he pursues a new way of life and behavior he should be allowed to come and learn and taste and drink deeply of the Gospel until Christ is more formed in Him (37). It is very refreshing to hear someone willing to break or modify their formula to help others seek the Lord. Take a lesson from Williams and infuse your gatherings with the Grace of God. Williams speaks to many more aspects of the Christian gathering. Particularly he spends a lot of time focusing on the character traits and aspects of leadership for those that faithfully steward Christian gatherings in dialogue III and IV (22-38). He also gives very well thought out questions to be asked of persons seeking membership in Christian groups (34-36), and questions to be used in the group to get at the heart issues of its members (39-41). If you need to rethink your small group, Bible study, Sunday school class, or even your church service, take some time to consider Williams little book. Williams will help you reset the foundation of your group by getting the heart right first. I found his book to be a refreshing reminder of what God wants to do in His people by His Spirit that indwells all believers.